Then-Evanston police Cmdr. 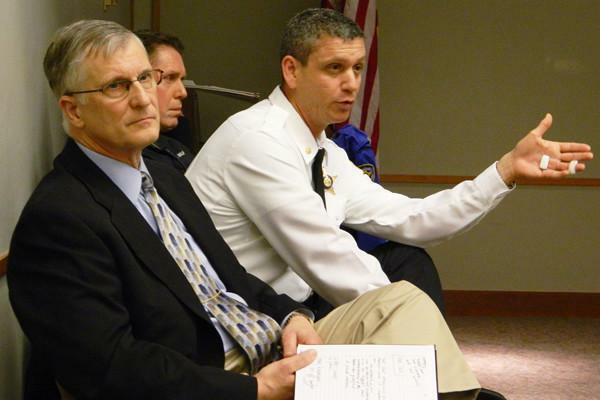 Jay Parrott (right), who is now the Deputy Police Chief, talks to residents at a 2013 community meeting. Police Chief Richard Eddington (left) is asking City Council on Monday to fund police body cameras. Evanston Police Chief Richard Eddington is asking aldermen to fund police body cameras at City Council’s meeting Monday night. Evanston police are requesting permission to apply to Cook County for a grant for federal funds for body-worn cameras. The city would have to match the funds provided by the county if EPD is awarded the grant. Although the Illinois state legislature has not passed a law explicitly legalizing body-worn cameras, Eddington said he believes legislators will pass such a law by the time the department could start a program to use them. The grant requires police departments to partner with academic institutions to gauge how effective the cameras are. EPD has reached out to several universities about a potential partnership if the department secures the grant, Eddington said. Eddington declined to say which universities the department has reached out to, but said they are not limited to Chicago-area institutions. Aldermen are scheduled to vote on the proposal Monday evening. Council will also vote on updates related to the Robert Crown Community Center and Ice Complex project. Aldermen, who have discussed the project for years, have been considering whether to renovate or rebuild the community center. Members will vote on whether to authorize city staff to issue a request for a proposal seeking a fundraising consultant for the project. The consultant would raise $5 million in additional funds for the project, which is expected to cost between $18 million and $30 million total. The tentative fundraising deadline would be Dec. 31, according to a memo to council members from Mayor Elizabeth Tisdahl. John Ronan Architects will give a presentation to council members Monday on the two concept options for the project. The options will include both a renovated center option and a new center option, according to the memo. Depending on factors including council decisions, construction could begin by spring 2017, the memo indicated.